He's neighbour then to Castle Hall." Crossing over to the Hopton side of the river by a skew-bridge of 6 arches, we skirt down the south-east side of the valley, and shortly pass through the grounds and in front of the mansions of Thomas and Charles Wheatley. Esqrs. Lower down, on our left, are the Cloth mills of Messrs. Nussey and Sykes, and the Corn mill of Mr. Pilling. On the hill is St. John's Church, Dewsbury Moor, consecrated 24th September, 1827, and in the incumbency of the Rev. John Payne. After passing through a deep cutting, where the coal strata may be distinctly observed, we proceed on an embankment to the DEWSBURY Station, passing on our right the Thornhill-lees Iron Works, and on our left, near the Station, the Blanket and Woollen manufactory of Messrs. Hagues and Cook. The Station is situate at Thomhill-lees, about three quarters of a mile from Dewsbury, 40 1/2 miles from Manchester, and 19 1/2 from Leeds. Dewsbury is a place of great antiquity. It was the common centre whence Christianity spread itself over the vale of Calder, through the preaching of Paulinus, the Roman missionary, who erected a cross here, of which the wheel-cross bearing his name, that stands on the outside of the church, is supposed to be a fac-simile. It afterwards formed the head of a Saxon parish, containing an area of 400 square miles. The principal trade of the town and neighbourhood consists in blankets and carpets. The finer descriptions of goods are also made here. The population is about 12,000. Wednesday is the market day. Thornhill-lees, where the station is situate, was formerly an extensive park, containing the residence of the Thornhill family, (of which little more than the site remains;) from whom the estates passed to the Savile's. They are now enjoyed by the Earl of Scarborough. Leaving the Dewsbury station, and traversing a deep excavation, we continue down the valley on an embankment, with Thornhill on our right, where are a number of collieries belonging to Joshua Ingham, Esq. The Church, dedicated to St. Michael, is a venerable structure, and contains many monuments of the Savile family. The rectory valued at £988, is in the gift of the Earl of Scarborough, and enjoyed by the Rev. Henry Torre. A little further, we pass on our left the village of Ossett, where is a neat Church, in the patronage of the Vicar of Dewsbury, and incumbency of the Rev. O. L. Collins. We then cross the river by a wooden bridge, which is thrown over only as a temporary work, in consequence of a suit pending in Chancery, between the Company and the proprietors of Healey Low Mill, the latter being supported, it is supposed, by the Calder and Hebble Navigation Com­pany. We shortly afterwards arrive at the HORBURY BRIDGE Station, 43 1/2 miles from Manchester, and 16 1/2 from Leeds. The station house is formed of one of the arches by which the Wakefield road crosses the line. 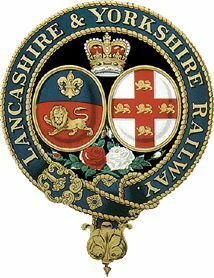 In 1847 the Manchester and Leeds Railway Company changed its name to the Lancashire & Yorkshire Railway, the change of name reflecting the companies growth throughout the two counties. The age of the railway had arrived and in coming years Mirfield would play its part.